Posted By:Unknown | At:7:00 AM Be the first to comment! 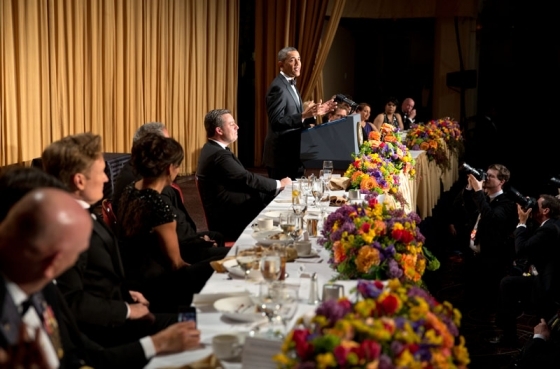 I don't know who did the writing for President Obama when it came to the White House Correspondent's Dinner, but man did he have me cracking up. First of all, the President walked up to the podium to new theme music: DJ Khaled's 'All I Do Is Win.' Yes, you read that correctly. DJ Khaled and the President in the same sentence. The music alone had me crunk. No one was off limits when it came to his jokes. He went after CNN, Jay-Z, Maureen Dowd, Sheldon Adelson, and NBC. He even took shots at himself mentioning the snafu in which he called Kamala Harris the most beautiful Attorney General in the country. "Who knew Eric Holder was so sensitive." He joked. He poked fun at the Republicans' new outreach strategy to minorities by saying he knew one minority they could start with. The only person I felt sorry for was Conan O'Brien who had to follow up the President. He didn't stand a chance.